OK, that’s enough scaremongering…let’s get to it. You’re probably looking at the title of this post and thinking, “Shouldn’t it be called Backup, Update and Restore?” Normally you’d be right too but as I’ve had SDN deployed for a while now, the version I’m running doesn’t have the backup and restore capabilities. I therefore have to update the environment before I can back it up. Backing up your SDN infrastructure isn’t just a case of backing up the Virtual Machines as this wouldn’t ensure that quorum is maintained across your Network Controller nodes, this will be explained in more detail later in the guide. The first thing we’ll want to update is the server you manage your Network Controllers from, i.e. the server where you installed the RSAT-NetworkController feature. For my lab, this is my SCVMM server which is fortuitous as this server should be kept at the same patch level (as mentioned above) as the rest of the servers that make up your SDN infrastructure. Everything looks good so far…so that’s good! The output below shows the status of my NCs just after node 1 has been patched and rebooted, note that it’s currently showing as “Down”. We’ll need to wait a few minutes until the status changes to “Up” before continuing on to node 2. The same process should be repeated after patching nodes 2 and 3. Once you have run through the above steps for each Network Controller node and all are back up and in a healthy state, one last step is required to update the microservices running within the Network Controller cluster. This job is kicked off by the system within roughly an hour, however this task can be initiated by ourselves to force the update to take place immediately. NOTE: This step can take a while to complete. Now that our Network Controller cluster has been updated it’s a good time to redo our Tenant VM pings tests (from earlier in this guide) to make sure everything is still working as expected…assuming we’re all good, let’s move on to our Software Load Balancers. Nothing of note to be aware of here guys, just update each SLB VM in turn to maintain availability of the service throughout. Your mileage here will vary of course depending on your networking and the responsiveness or the external source you’re pinging. As mentioned in an earlier guide, I’ve not yet done much with the RAS Gateway role but have included it here as there are some best practice recommendations when updating the VMs. This section assumes a 3 node Hyper-V cluster each hosting a RAS Gateway VM. Although the RAS Gateway VMs CAN be Live Migrated, doing so will drop any tenant connections currently using that VM as they’re failed over to a surviving Gateway. It’s for this reason that I’ve set my RAS Gateways to NOT live migrate, they will instead go down with their host (salute). NOTE: Before this piece of work is implemented, I would recommend making your tenants aware of it and scheduling it for a time where it would have the least impact. Pick the Hyper-V host that’s running your standby RAS Gateway (We’ll call this RASGW1). Evacuate it of Live Migration capable VMs – NO TENANT IMPACT. Install updates on the RAS Gateway VM and reboot if required – NO TENANT IMPACT. Install updates on the host and reboot as required – NO TENANT IMPACT. Repeat the process for your second Hyper-V host and the RAS Gateway (We’ll call this RASGW2) hosted on it – TENANT CONNECTIONS FAILED OVER TO STANDY GATEWAY (RASGW1). If you have a cluster comprised of more than 3 hosts and/or more RAS Gateway VMs, continue the above process patching Hyper-V hosts running Gateway VMs first, and lastly, hosts without Gateway VMs. 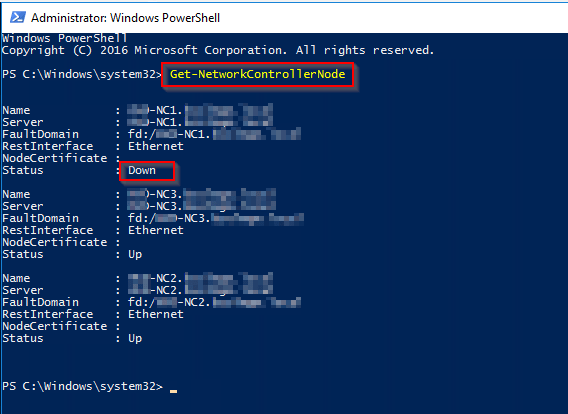 NOTE: Remember to reimport the NetworkController PowerShell module on any server you plan to target your NCs from, otherwise you’re NC backup commands will fail. …and that’s it, your SDN infrastructure should now be fully up to date and was hopefully done with the absolute minimum of downtime for your tenant workloads. The above process should be followed any time you’re updating this environment. NOTE: If you installed your Network Controller using a Group Managed Service Account (GMSA), you can use that here too. Backup the Network Controller VMs using the backup tool of your choice. This gives you the ability to do a full SDN infrastructure restore if required and also grabs the required certificates for decrypting the database…so that’s nice. 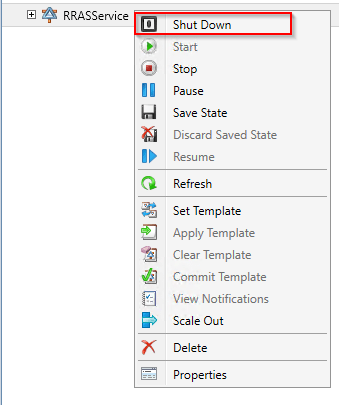 Stop the SCVMM service and take a backup of the SCVMM SQL database. Stopping the SCVMM service will ensure that no changes are made to the SCVMM database while the Network Controller database is being backed up, therefore making them inconsistent. NOTE: Do NOT restart the SCVMM service until the Network Controller DB backup has been completed. The credentials you use for the SCVMM SQL DB backup and for targeting your Network Controller service will be stored securely and can only be unencrypted (used by the script) if the script is launched by the user that stored them securely in the first place. You will be asked to enter a password for both of the above accounts on the first run of the script only. A user is created on the Network Controller for accessing the SMB share where the NC backup will be stored. On the first run of the script uncomment the following section “UNCOMMENT AND POPULATE USERNAME AND PASSWORD…” and enter a username and password that has access to the SMB share. This again only needs to be done once and the commented out section can be removed or commented out again on subsequent runs of the script. The script will keep checking the status of the backup job and will only continue when it has completed successfully (which in my experience doesn’t take long). (Get-Credential -UserName $NCUsername -Message "Please enter the password for the NCAdmin user").Password | ConvertFrom-SecureString | Out-File "C:\Temp\NCAdminPWFile.txt"
(Get-Credential -UserName $SQLBKPUsername -Message "Please enter the password for the SQL Backup user").Password | ConvertFrom-SecureString | Out-File "C:\Temp\SQLBKPPWFile.txt"
$BackupProperties.BackupPath = "NC BACKUP SHARE LOCATION\$BackupTime"
Well, that should take care of the backup piece, let’s move on to the often more stressful restore piece. For the purposes of this guide, I’ll only be restoring the Network Controller backup we took earlier. Depending on the situation you find yourself in though, here is the order you would follow assuming the worst had happened and you needed to do a full rebuild of your environment. These are only the steps, I’ll go through a subset of them in detail that suit the restore process we’ll follow in this guide. Step 1: Redeploy your Hyper-V hosts/cluster and any required storage. Step 2: Restore your Network Controller VMs, your Software Load Balancer VMs and your RAS Gateway VMs from backup. Step 3: Stop the SLB Host agent and NC Host Agent services on all Hyper-V hosts. Step 4: Stop your RAS Gateway VMs. Step 5: Stop your Software Load Balancer VMs. Step 6: Restore the Network Controller e.g. from a backup like the one we took earlier in this guide. Step 7: Check the Network Controller restore Provisioning State to make sure the restore completed successfully. Step 8: Restore the SCVMM VM (if required )and database from backup…remember to stop the SCVMM service or cluster role if it’s Highly Available. Step 9: Restore workload VMs as required. 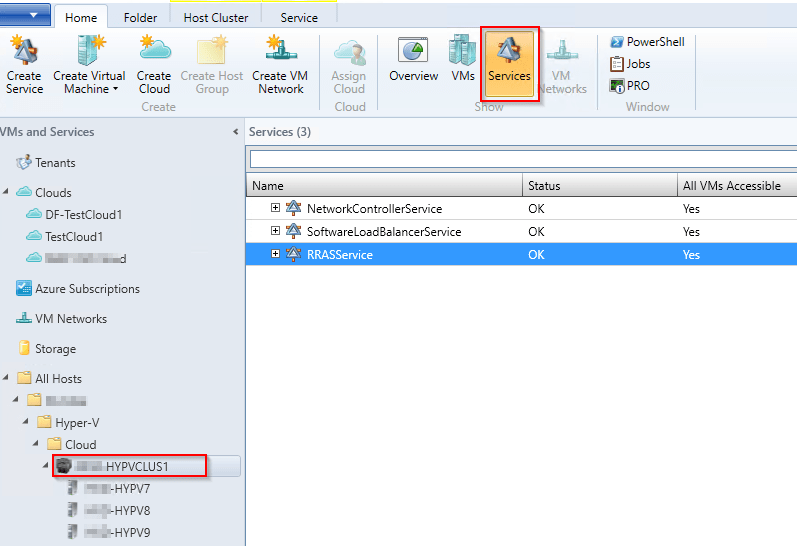 Step 10: Start the NC Host Agent and SLB Host agent services on all Hyper-V hosts. Step 13: Check the health on your SDN infrastructure. Step 1: Stop SLB Host Agent and NC Host Agent services on all Hyper-V hosts (this code was written to run from your SCVMM server). The SLB Agent is stopped first as it’s a dependant of the NC Host Agent service. $HyperVHosts = Get-SCVMHost | ? HostCluster -match "Hyper-V Cluster FQDN"
The easiest way to do this is from within SCVMM as we can shut down the entire service in one go. Right-click your RAS Service and select “Shut Down”, all little worryingly though is that it doesn’t prompt for confirmation…it just goes ahead and does it. Expand the service and wait till the status of all nodes shows as “Stopped” before continuing. Step 3: Repeat step 2 to shut down the Software Load Balancer service. Step 4: Restore the Network Controller from the backup we took earlier in the guide. This script was written to be run from your SCVMM server. You will be asked to enter a password for both of the above account on the first run of the script only. A user is created on the Network Controller for accessing the SMB share where the NC backup will be stored. On the first run of the script uncomment the following section “UNCOMMENT AND POPULATE USERNAME AND PASSWORD…” and enter a username and password that has access to the SMB share. This again only needs to be done once and the commented section can be removed or commented out again on subsequent runs of the script. NOTE: I’ve had to put in an “ipconfig /flushdns” into my “CheckRestoreProgress” function as it seems SCVMM will intermittently lose connection to the NC connection URI (MultiNodeNC.domain.com) while it’s being restored. This will also cause the odd connectivity error to be thrown while stepping through that loop, but that will stop about 30 seconds into the Network Controller restore job and the script will continue without issue. It’s therefore OK to ignore the red if it’s during that loop. I’m speaking to Microsoft to ask if that’s expected behaviour or not (I assume it is though as a connection issue doesn’t seem unreasonable during a service restore from backup). I’ve also not suppressed the connection errors as it’s possible we’d also suppress an error we want to see. $RestoreProperties.RestorePath = "UNC Path to SMB share\Folder Name of NC Backup"
Step 7: Start the NC Host Agent and SLB Host agent services on all Hyper-V hosts. Step 8: Confirm services started as expected. Step 10: Leave things for a couple of minutes and then confirm you can ping both internally and externally from an SDN tenant connected VM. 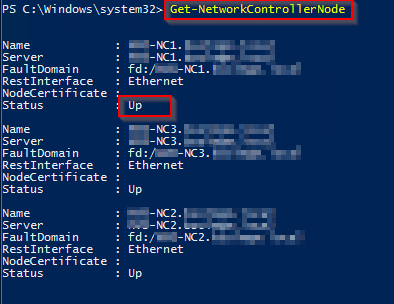 Step 11: Run the Debug-NetworkControllerConfigurationState cmdlet to check the status of your SDN infrastructure. If you see the following output, wait a few minutes and run the command again. All going well, you have now successfully walked through a backup and restore of your Network Controller and SCVMM databases…nicely done! I’m off to enjoy a long overdue beer, see you in the next post.